1:26 And God (‘elohiym) said, Let us make mankind in our image, after our likeness: and let them have dominion over the fish of the sea, and over the fowl of the air, and over the cattle, and over all the earth, and over every creeping thing that creepeth upon the earth. This is referring to creation of all the kindred peoples/races in the world. 1:27 So God created this particular man in his [own] image, in the image of God (‘elohiym) created he him; male and female created he them. This is referring to the creation of “this particular man” (or these particular men or types of people, prototypes). 2:7 And the LORD GOD (YaHoVeH ‘elohiym) formed this particular man [of] the dust of the ground, and breathed into his nostrils the breath of life; and man became a living soul. This is referring to the forming of one particular type of man, i.e. those with the breath of life in them or God’s spirit indwelling in them at birth. 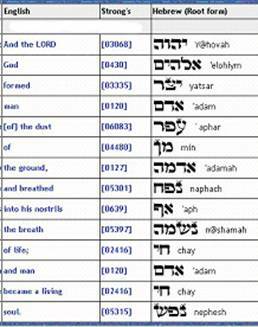 The fact that God made Adam from dust simply tells us that Adam was made from the ground (adamah). The word dust is "'aphar", and means loose earth or ground. NOTE: Use of the words "mankind" and "this particular man" in the above verses is based on the interpretations of the Dead Sea Scrolls. 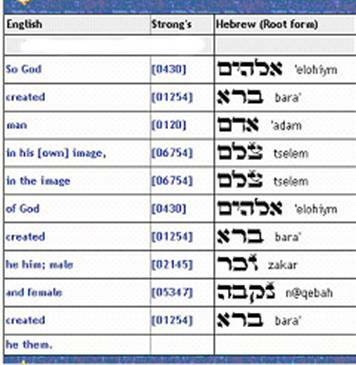 All of these words refer to the creation of human beings, but the word “form” is the only one that refers to the people Israel or those pre-ordained and predetermined. Therefore, the forming of “this particular man” in Gen 2:7 is referring to those that would be Israel or those predetermined and/or pre-ordained such as Jeremiah whom God knew before he formed him in the womb. This would also be the seed line through which Christ would descend but more on this later. These have God’s spirit in them, the Holy Spirit, and are the chosen ones from the foundation of the world. See 1 Peter 1:20. Mankind refers to ALL of creation. In 1:26, mankind is made by the ‘elohiym in the image of the ‘elohiym but they do not necessarily have the breath of life in them. The definition of "‘elohiym" is 1 a) rulers, judges, b) divine ones, c) angels, d) gods; 2 a) god, goddesses, b) godlike one, c) works or special possessions of god, d) the (true) god, e) god. In 1:27, the ‘elohiym create this particular man (or these particular men or prototypes) in the image of ‘elohiym. This particular man unequivocally refers to a portion of creation as if to suggest that there is or will be another part or phase to it. The making of mankind and the creating of this particular man (or these particular men or prototypes) are both done by the ‘elohiym and in the image of ‘elohiym. ALL of mankind resembles the ‘elohiym, i.e., man looks similar to the ‘elohiym, in that they have heads, torsos, arms, legs, etc. This making and creating of mankind and this particular man (or these particular men or prototypes) were done on the 6th day. Moreover, all the various races made/created on the 6th day were good. Gen 2:1 tells us, “Thus the heavens and the earth were finished, and all the host of them.” The word “host” means a mass of persons. The ‘elohiym ended their work and then rested on the 7th day. After the 7th day, we find that “The Lord God had not caused it to rain upon the earth, and [there was] not a man to till the ground.” For this reason, The Lord God formed this particular man (or prototype) AFTER THE PARTICULAR MEN OF GEN. 1:26,7 WERE CREATED – the second phase if you will. They are distinct creation events occurring at different times, in different sequences, and even performed by different entities (the ‘elohiym versus The Lord God). As we noted, the word “formed” refers to Israel and/or those who are pre-ordained or pre-determined, i.e., the chosen ones or YHVH’s election. This particular man Adam was ruddy complected or showed blood in the face (to blush) or what we know as the caucasian race. We can ascertain from the word of God that Adam was formed approximately 6000 years ago. Consistent with this belief, history shows that the first written record of man's existence was written approximately 6000 years ago. Other historical evidence shows that the Chinese civilization, for example, dates back as far as 10,000+/- years ago. Gen. 5:1-2 also refers to the creation event. This chapter concerns the genealogy of the individual named Adam, as well as a brief rehash of the Gen. 1:26 & 27 creation event. It affirms that all man/mankind were created by and in the image of the 'elohiym. Gen. 5:2 Male and female created he them; and blessed them, and called their name Adam, in the day when they were created. This verse seems to refer to the creation of both male and female as found in Gen. 1:27. This deviates from the Gen. 2:7 account in that God formed only the male and then later created the female but this deviation is not significant since the end result was the same. God ultimately made a female helpmeet for Adam. In Gen. 1:28, God blessed the creation and told them, “Be fruitful, and multiply, and replenish the earth.” In contrast, Adam and Eve were not instructed to procreate. It wasn’t until after the fall that Adam and Eve began procreating. Therefore, the purpose of the forming of the particular man in Gen. 2:7 was different than the purpose of the making/creating of the particular man in Gen. 1:26 & 27 but more on the purpose later. 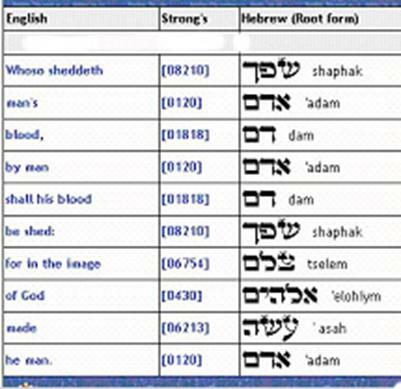 Also consider Gen 9:6, Whoso sheddeth man's (‘adam) blood (dam), by man (‘adam) shall his blood (dam) be shed: for in the image of God (‘elohiym) made he man. This verse states that the ‘elohiym made this particular man in the image of the ‘elohiym consistent with Gen. 1:27. The word made (‘asah) is the same word as make in Gen 1:26. Again, Gen 9:6 is consistent with Gen. 1:27, i.e., this particular man (or these particular men or prototypes) were made by and in the image of the ‘elohiym. Therefore, Gen. 9:6 proves nothing more than this fact. Based on Gen. 1:26 we know that ALL of mankind was created in the image of the ‘elohiym. For several reasons, Gen. 9:6 does NOT prove that Gen: 1:26 & 27 are the same creation event as Gen. 2:7 but only that the creation of all men are in the image of the ‘elohiym. Gen. 2:7 doesn’t mention that this particular man is created in the image of the The Lord God or the ‘elohiym, for that would be superfluous. In Gen. 2:7, The Lord God formed this particular man (and not the ‘elohiym);The Lord God (and not the ‘elohiym) blew the breath of life into this particular man; in the 6th day creation, the animals were created before man whereas in Gen 2:7, the animals were created after man; in the 6th day creation, man was created both male and female whereas in Gen 2:7 Adam was created, then the animals and then Eve. All of these factors prove that the Gen. 1:26 & 27 creation account was a separate and distinct event from that of Gen. 2:7. 1 Cor 15:45 And so it is written, The first man Adam was made a living soul; the last Adam [was made] a quickening spirit. Adam = "the red earth"